These unique discs from 3M are a new type of abrasive that is superior to sandpaper flap wheels or other types of sanders brushes or abrasive wheels. Their flexible bristles can reach into areas with detail and irregular curved or flat surfaces. Woodcarvers will appreciate how well they remove the "fuzzies" without harming any of the underlying detail. In the dental lab these discs are excellent for cleaning pre-polishing and polishing of metals and acrylics. They are especially good on hard to polish materials like titanium and valplast. Coarser grits can be used to carve grind and texture while finer grits will smooth burnish and polish. 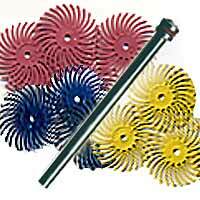 The 3M Cubitron and aluminum oxide grains embedded throughout the plastic bristles make them very long lasting. Individual discs are stacked to make a brush. Depending on the application you will want to stack between three and six discs. Be sure to closely follow the directions in the package so that the discs are stacked and mounted properly onto a handpiece or the bench lathe. Recommended operating speed for most applications is 3000 - 18000 RPM (5000 for woodcarving).